In order to add the interest of the game and offers some bonus for players, fifaah.com provides the FIFA Packs Simulator that including two ways to play, allows you have the opportunity to win Cash Code for FUT Coins and collect your favorite FIFA 19 Ultimate Team Players. Open the FIFA Bonus Pack, you will have chance to win free Cash Code. 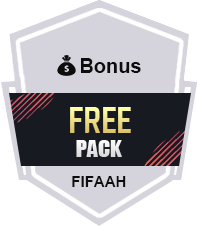 FIFA Bonus Pack covering Informs Card, POTM Card, MOTM Card, Heros, Legends and TOTY Players, open the pack, you can get a group of players from these card, the total value of which will be shown on the leaderboard each day, Top 20 Pack Opener on the leaderboard can get 4.99USD Free Cash Code every day, enjoy max 20% discount to buy FIFA Coins. Play the FIFA 19 New Pack Simulator , you are probably get any top rated players. We will update the latest FIFA 19 Team of the Week squad and other promo cards in Our FIFA 19 Packs Simulator. Open any set of FUT 19 packs in the list, you can pack 10 cards with at least one of these cards included in the TOTW/FUT Birthday squads. Specific rewards rules will be subsequently updated, stay tuned!